Like skydiving, swimming with sharks or bungee jumping. But I can say, without a shadow of a doubt, that there have been times I’ve wanted to “quit my business.” Leave it. Drop it. Move on. Funnily enough, one may think that’s a common thought in the early stages of business, and perhaps it is… but I know many of us have had those thoughts much more commonly in the later years of business. Is it that the stakes are higher? Yes. No. Maybe. Whatever that means. Is it that more is riding on our business’ success? Probably. Is it that we’re seeking more and more success, stability and support from our businesses? I would say yes. Is it that as a movement of female ‘online’ or creative entrepreneurs, we put more and more pressure on ourselves, to be bigger, better, more profitable and more visible every single day, week and month? With ‘6 figure’ businesses and fully booked calendars and Huffington post articles? Again, I would say yes. And you know what? There’s absolutely nothing wrong with wanting those things for yourself, and for your business. Visibility, financial security, an abundance of amazing clients, publicity and public recognition are what so many of us are working towards, on many levels of our business (and life), and that’s wonderful! But on the other hand, there’s something not quite right about pushing yourself to the ends of the earth in order to create a hugely ‘successful’ business (whatever that means to you) in the same amount of years as digits on one hand, or having huge expectations of yourself and your business and putting yourself down if you haven’t reached a certain stage within a certain timeframe, or giving yourself a hard time about… well, anything and everything to do with your business. In so many cases, the ‘how’ is as important (if not more important!) than the ‘what’. There are so many ways to define success, hence there are so many ways we can be successful. There are also so many ways we can remind ourselves of what we’re doing, why we’re doing this, and how much we want to be doing it, if or when things start feeling hard. I believe that if you ever find yourself feeling incredibly “charged” about your business in a negative, reactive way, I truly believe it’s because you love your business so much… and that reactivity is in part, due to a fear that it won’t “work”, or in some way, that it doesn’t love you back. This is when I feel we’re putting too much energy into one element of our business, and it’s a loving sign that it’s time to stop, take a breath, change something up, let something go, and open up to receive in a fresh, new way. So if you ever find yourself getting caught up in feeling down, depressed and lost because you think your business hasn’t taken off (yet), here are some steps that may be soothing for you to read, absorb and action. They’ve helped me, and my 1:1 clients too, and here’s hoping they help you too. So many of the times I’ve felt stuck or stagnant in my business has been because I’ve been either not looking after myself properly, or focusing too much on what’s lacking. And there have even been times when I have been looking after myself really well, but still been pushing myself to work when I can feel there’s nothing of real importance to do, sitting at my desk until 6pm when I could’ve gotten up at 3pm, or pushing myself to get things completed within a self-imposed deadline that makes absolutely no difference to any bottom line. If you’ve been going through a stage where you’re pushing, pushing, pushing… please take a very large, steady, conscious and expansive step back. Today, right now, this very moment, if you can. Your mission, should you choose to accept it, is to go and find some joy, peace and inspiration from other places, to do something you don’t usually do to help you find some perspective, and to get a clear head. Go to a new cafe and journal, plan a cheese and wine night with friends, go to the movies at 3pm, read a new novel, go to a midday yoga class, watch something funny and uplifting, write a long poem or a short story just because, go for a long walk, take some time out. All of these things will help re-energise you and help you feel more positive. From this headspace, everything will start to look up! If you keep pushing yourself into the ground by doing the same thing over and over again, it’s a calling to you to take a step back. You cannot make something beautiful grow out of force and fear. So please, step back, and cultivate joy in your heart, mind and life so that you feel re-inspired to make a difference in your business, life and in the lives of your clients. Every single thing you do in your business today is a seed; it’ll either grow into something beautiful, or not grow into anything at all. The most important part is that you planted it, because if you hadn’t, what could ever grow there in the first place? You have no idea when it’ll blossom, sprout or grow. But planting it is what counts, because you’ll learn from this, you’ll grow from this, and planting a seed one day, may turn into two beautiful flowers the next. Think of the mighty oak tree; it takes 20 years for an oak to begin sprouting acorns of its own. 20 years. Now imagine if you’re a little baby oak tree, watching the oak tree next door sprout an acorn. To you, this looks like an overnight success! Wow! An acorn! So quickly! How did she do that? Where’s my acorn? Can I not grow an acorn properly? Will I ever be able to do this? Yet it took 20 years of being steady, showing up every day, growing roots, extending branches, being present, doing the work and being patient (not the same as ‘waiting’) to sprout that acorn. And that oak tree could stand for 100 years because of all those roots it grew. The message? Don’t rush your roots. Take your time to build your business, your dream, your empire, and ignore all the ‘overnight success stories’. You can be your own success story, and the best part is that when you have the right roots in place, greater success will mean you can extend your branches further with a solid base in place. It means you can reach out and rise up, and you’ll always know where you came from, how you got there, and how to stay grounded in who you are. That’s what lasting success is made of. Write down any and all of your concerns and worries, and next to them, write out both a) what would happen if this did come true and b) what would happen if this never came true. Right away, you’ll feel lighter and brighter because the truth is, no matter what happens in your business, you’ll still be okay. You; you as a person, as a human of this earth, you’ll still be okay. And you are more important than your business, so when you can look your fear squarely in her very intense eyes you’ll see the truth for what it is; that this is merely a moment in time, that there is always a solution, that you’ll make it through this in one way or another, and that most importantly, you will be okay. Kinesiology has been one of the most important things I’ve done for myself in my business, and I’m continually supported by it, as are my clients. When things are feeling overwhelming, stuck, stagnant and cloudy, kinesiology helps you clear the fog, draw out what’s important, find and understand your triggers, and get crystal clear on what you need to do next, so you can work towards your dreams and goals and create your beautiful business. If something isn’t working for you in your business, kinesiology can help pinpoint the underlying stress or emotion, the why, and help you release that stress in order to move forwards with more confidence, with more lightness, and with more ease. It can help you open up to more abundance and flow, by helping you activate your personal power. In all honesty, it’s the single most important business tool I use, on a daily basis. If you’d like to experience this for yourself, book your kinesiology session here. If most of your stress seems to be around money and finances, spend a little bit of time giving your current finances some love. I love Danielle LaPorte’s idea of checking your bank account every day and sending that money some grateful love, and Denise Duffield-Thomas’ idea of tracking every single cent that comes into your life, from business income, to a friend buying you a coffee. When you are grateful for what’s coming into your life, you’ll also start to really notice everything that’s coming into your life, and this shift in vibration can help you feel more steady and stable. Check in with your invoicing and accounts too – does anyone owe you money from an old invoice that you can collect now? Can you put any private health insurance claims through, to receive the rebates? If you have digital products, what about holding a little flash sale? And if you have any clients who haven’t been in to see you in a while, why not send them a lovely email with a coupon code offering a slightly discounted price to work with you (by a certain date), to create some more flow and momentum? And you know what? If you want to (or need to) bring in some extra income on the side through a part-time job while you build your dream business, that’s totally and wonderfully okay too. If that means you’ll feel more supported while you work towards what you really want, there’s no negative or downside in doing so. In her book Big Magic, Elizabeth Gilbert talks about how she had jobs on the side for years while she wrote, and wrote, and wrote. She says she didn’t want to put pressure on her creativity, so she supported herself in other ways until her writing could support her. And now look where she is? She’s Elizabeth Gilbert! There have also been times in my business where I’ve felt this need to ‘get out’ but it really had nothing to do with quitting… instead, it had everything to do with up-levelling. Is there something that isn’t working in your business, either because you’ve outgrown it, or because it’s simply creating more weight in your business and it’s time to let it go? 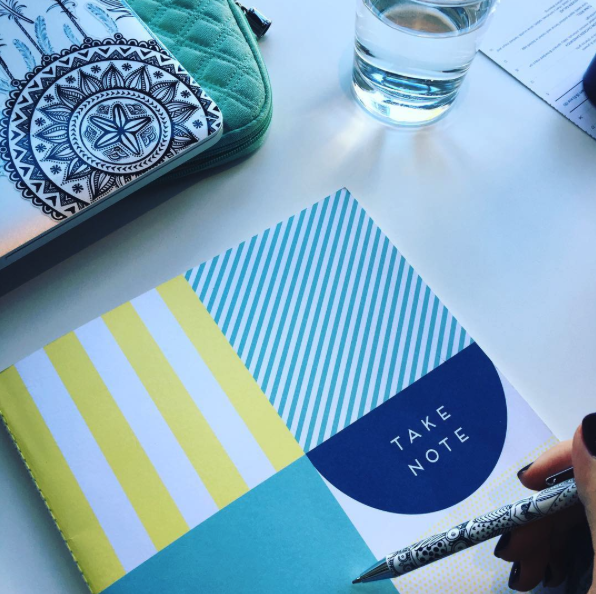 I have another mission for you, should you choose to accept it: grab your daily planner or calendar now, and block out one morning (as soon as you can – what about this week? ), to go and spend some time in a park or cafe with a fresh notebook, and a big coffee or tea. On one page, write out everything and anything that is working for you in your business. On this page, write thank you. On another page, write out everything and anything that isn’t working for you in your business. On this page, write Okay, what can I do about this now? Sit quietly for a few moments and let yourself be guided as to what you need to let go of, tweak or up-level. You might also love my free Beautiful Business Workbook to help you get clear on what’s not working for you in your business, so you can make space and invite in more ease, joy and flow. How are you feeling in your business at the moment? Is there anything you like to do when/if you’re feeling unsteady and uncertain about your business’ future? How kinesiology can help your heart-centred business Do you want to love what you create in your business in 2017? A letter to my business Go easy on yourself and watch your business flourish Are you having fun in your business?